Enticed by warming waters, king crabs might soon make a run for Antarctica’s continental shelf where they haven’t been seen for at least 10 million years. 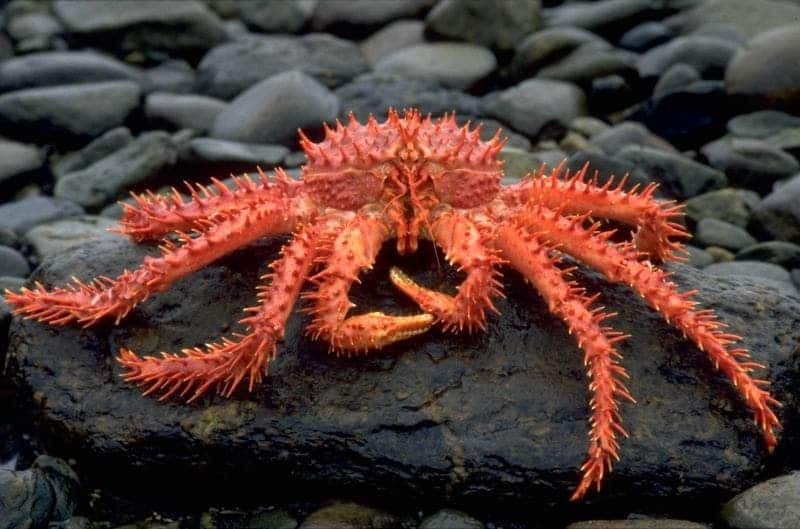 As such, the fragile wildlife comprised of creatures like sea stars, sea worms, sponges, sea anemones, sea lilies and feather stars – all lacking protection against the crushing claws of the king crab – could face rapid annihilation. Antarctica is one of the coldest, inhospitable place on Earth. Same goes for its shoreline and coastline waters, but even at chilling depths life has found a way to flourish. King crabs, however, can’t stand waters colder than 1 degree Celsius. As such, they’re content living at the bottom of the ocean, staying clear of Antartica’s continental shelf. In recent years however, scientists have observed these have gone ever closer to what would normally be a restricted habitat for them, off the coastline of West Antarctica. Reports of venturing crabs started flowing in 2007, so in 2010 Richard Aronson, a professor of biological sciences at the Florida Institute of Technology, got funding to survey the waters. Using submerged probes they photographed the ocean floor off the Marguerite Bay on the western Antarctic peninsula. They excepted to find a couple of crabs, but nothing prepared them for a colony numbering thousands, mostly a king crab species called Paralomis birsteini. Moreover, the population is stable and is reproducing fast. However, this in itself wasn’t particularly alarming. The researchers observed the crabs at depths of 2,759 feet to 7,434 feet, which is still safe. Some, however, were found at depths up to 1,312 feet deep, which is the lower limit where soft bodied marine life inhabits the Antarctic continental shelf. Thing got worrisome, so the researchers wanted to assess the situation better. They designed a model to see if present conditions like pressure, salinity, temperature and the likes would impede an invasion. The only factor that seems to keep them at bay is temperature and this barrier might not hold for long. The waters west of Antarctica have warmed by a staggering 1.5 degrees Celsius or double the global average. Aronson’s findings are similar to those of Craig Smith, a biological oceanographer at the University of Hawaii at Manoa. His group found another population of king crabs in an area called the Palmer Deep, north of Aronson’s study site. “Because other creatures on the continental shelf have evolved without shell-crushing predators, if the crabs moved in they could radically restructure the ecosystem,” Aronson said, who published the paper in PNAS. Now, some would say this is only natural. Ecosystems change all the time, but in this particular case the king crabs have such an unbalanced advantage that the soft tissued marine life doesn’t stand a change and could become wiped out before they have a change to adapt. In other parts of the world, marine life has learned to develop shells to counter act the crabs’ deadly pinchers. This is truly an alien invasion. “The barriers for these predators are starting to evaporate,” Aronson says. Meanwhile, on land, another invader has taken up residence. It’s a midge, a type of very small fly. The busy flies, natives of South Georgia Island, seem to be speeding up the rate at which decomposition occurs in the Antarctic soil, which typically undergoes very slow rates of decay. Native Antarctic species are a picky, delicate bunch, so any change, even as slight as faster soil decay, could disturb them.